I love all the textural elements that were incorporated into this space. The wooden ceiling and brick wall add so much texture, warmth, depth, and dimension. I also love how the room maintains some of its original features, despite the modern furnishings and decor. It adds charm and character. 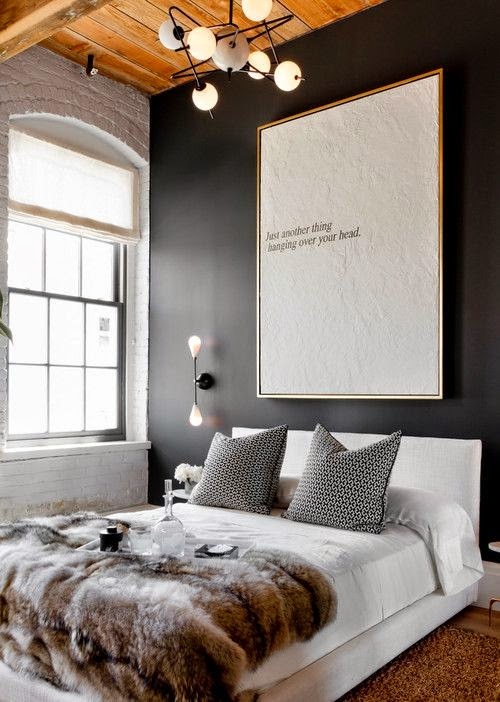 The crisp white bedframe and bedding, as well as the charcoal gray wall, are warmly offset by the soft layers of fabric and pattern found in the euro pillows and throw blanket. The natural fiber area rug also adds another textural element that "cozies" up the overall modern vibe of the room. My favorite design elements in the room, however, are the light fixtures and art piece. I LOVE their simplicity and quirkiness (is that a word?!). Your eye is immediately drawn up to the textured wooden ceiling since the light fixture adds so much interest. The wall sconce repeats the look of the ceiling light fixture, but in a much simpler and streamlined way. And I love how the quote in the wall art "speaks" to the ceiling fixture! A few simple words were made "grand" by using an oversized frame. So easy to replicate as a DIY, folks!! !